I expect their to be some bumps in the road and hopefully those bumps won’t cause injury to myself or my friends here on the compound! Envision a few teachers, a few students, and a few pilots sitting outside “on the patio” of the Russian built concrete living quarters basking in the moonlight and taking in all the stars (without any freakin’ beer or wine). Don’t forget to also envision the fluorescent lighting that allows us to see our tea, snacks, and mini iPod player, too! As quiet hours are approaching, it’s time for all to head to their rooms and call it a night. After cleaning up, one would think you would find the area the same when you wake up in the morning — except for the moonlight, of course. Well, no one heard a thing, no one smelt a thing, and no one stirred in the middle of the night. 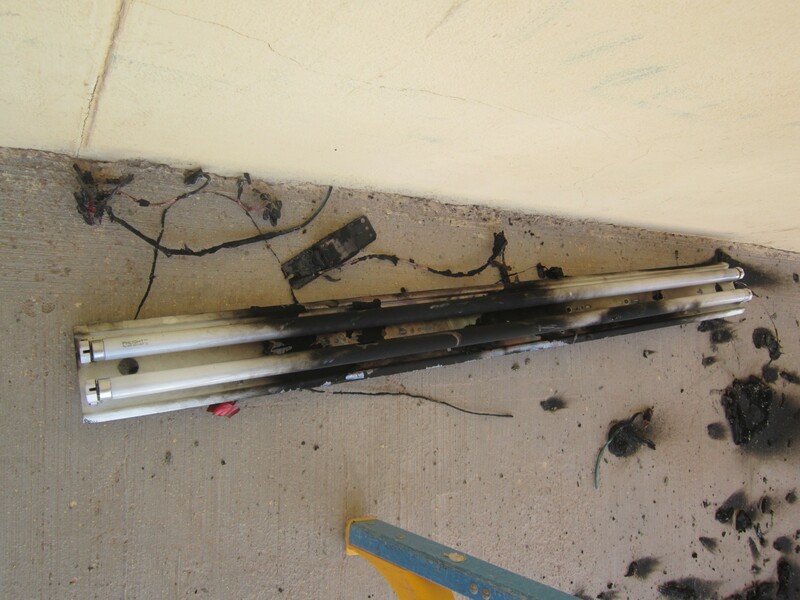 As I open the door to my room, and turn right to put the combination into the bathroom door (which is located right next door), the lighting has caught on fire, burnt the ceiling, burnt the wall, melted the plastic, glass all over the ground, and all the wires are hanging out of the ceiling — with part of metal still hanging from the wires, too! Thank goodness no one was out there and concrete is all around the sh0tty wiring in the building! 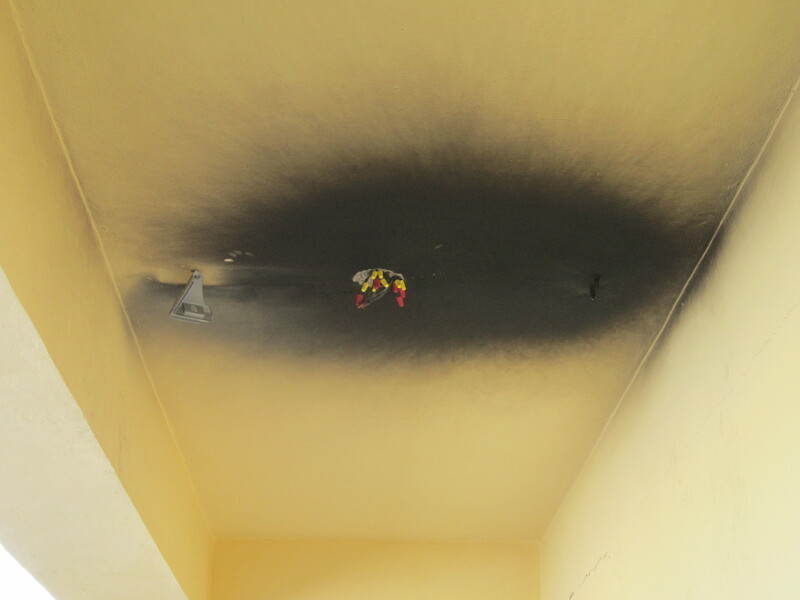 Yes, our room has a smoke detector in case one of our four fluorescent lights and its casing opts to explode… hopefully not while any of us are in the room since we all have one smack dab in the center of bedrooms! Never a dull moment around here — well, not never!! Wow, it is amazing to see every day the dedication my students have to learn English and want to better themselves. Every day is rather entertaining with, “Teacher, what is measure?” “Student, measure is to determine the amount for liquids in ounces; to determine the length/width/height of objects/people, etc” “No, no, teacher. Measure.” “Yes, measure is to …. ” “No, no the man who came to talk to our class, is he a measure?” “A measure? Oh my goodness, not a measure, a Major. A Major is a rank in the military but the man who came today is the new Colonel for our area”. Measure, major — it’s the little things that make us laugh throughout the day. But in the end, the goal is to get up into the skies and fly — rather it be fixed wing or rotary! Well, the day finally came for 17 students who are moving on towards their goal! With certificates passed out and smiles all around, it was time to enjoy the birds that will fly in the sky! I was fortunate enough to have the exact same Timex Expedition Target special watch as Cdr. 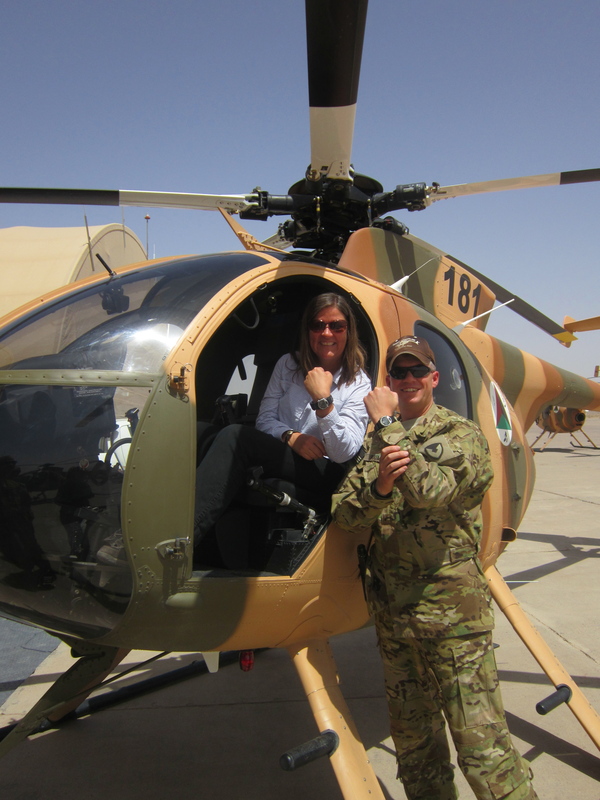 Jeff, who happens to oversee the pilot training program, and said that any day I was free, he would gladly take me up in his bird! While in Japan, I was able to fly in the cockpit during landing after a morale trip to Korea. While in Germany, I toured the outside of some big cargo planes, and now here, in my new country, I will be able to fly up in a bird and hopefully see more than sand!! 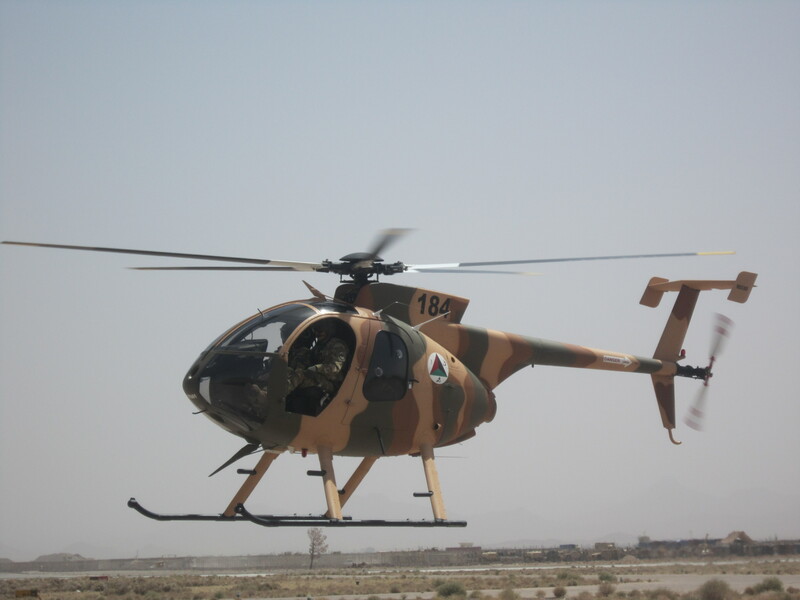 Not sure it will be better than my trip in the Black Hawk but I will be sure to let you know when it does happen! So, now what to do about those that want Bunny? I am willing to negotiate to make sure that Bunny stays safe while I am helping pilots become better English speakers. Any thoughts on how to save Bunny? I LOVE receiving care packages, letters, postcards, etc. but…. when a care package arrives and there is a wanted poster inside it makes me shudder at the thought that someone would want to capture me! But wait a minute, it’s not me they want to capture, it is Bunny! Yes, Bunny!! My “will travel with me from Florida to Japan, to Germany, to my new location (okay, only in picture format but still with me) is suddenly wanted! 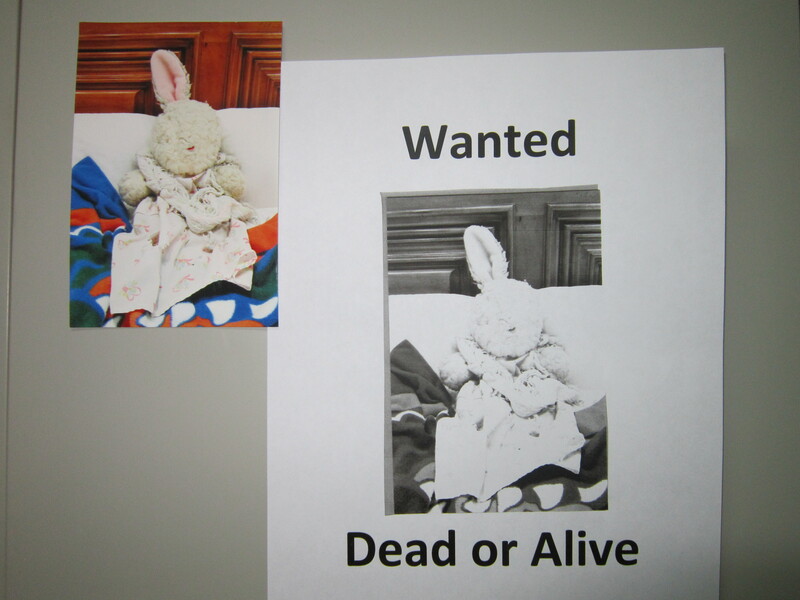 I don’t believe wanted in a good way to keep company, or to comfort b/c Bunny misses me, no in a “Dead or Alive” situation! Bunny, who wears my pajama’s from when I was a cute little girl in pigtails, along with my childhood blanket tied around its neck like a lovely scarf, the same one my brother tried to hide from me behind the piano! Plus, who would want Bunny “Dead or Alive” — he is missing an eye, plus an ear, once again from MY BROTHER who tried to pull him away from me and ripped off its ear!!! Should’ve Been a Math Teacher…..
but I know why I am not and that I am an excellent English language teacher instead! Yes, I enjoy math but I must admit it is because of the world’s best pencil out there! Do you happen to know the best pencil??? Yesterday, my students completed Text 12 and it was time for the ‘ole book test. Well, like any great teacher would do when it’s possible their students wouldn’t have the appropriate writing tool or eraser for the test, she shall provide. Indeed I did…….and because of great friends and family, I was able to share my joy and excitement of the Ticonderoga pencil with my students for their test! They were so grateful to receive the “Ticonderoga Test Pencil” with a sharp point and unused eraser, that all of them passed their first book test. Yes, they all passed with an 80% or above which means now we move on to Text 13 — which I am excited about b/c it’s all about sports!! 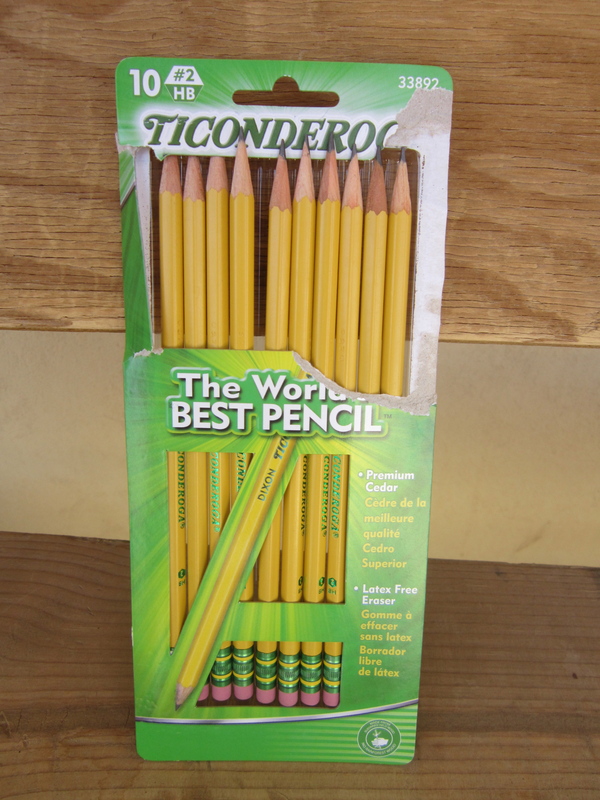 The “Ticonderoga Test Pencil” was collected upon test completion but all my students will be able to keep their best pencil ever once they complete the book test for Text 13. I believe I’ll take a picture of them smelling their pencil like I enjoy doing whenever I have the pleasure to scribe with the best smelling wood pencil out there!! I sure hope they have as much excitement about a pencil as I do ……plus share in my opinion!! Thursday Night is really Friday! If only I could taste the real thing, a nice cold Andechs at the Ratskeller or my favorite hole in the wall, Klein Konig! But, since I find myself enjoying strong winds and sand blowing everywhere, I’ll stick with what I can get here! Friday is our day off from teaching, so Thursday night is our night to live it up. Now, it is nowhere in the manner in which I would if I were in WI or any other place for that matter, but since I am digging the sand, I’ll cope with what’s available to me! A friend was staying in WI finishing up some business before heading out from FRA airport and he so kindly sent a picture of what I was missing — at least he enjoyed the cold beer in my honor! I know that many of you toast me on Friday Happy Hour, and even though I am not there, I sense it all the way over here! Thank you for having a beverage for me! 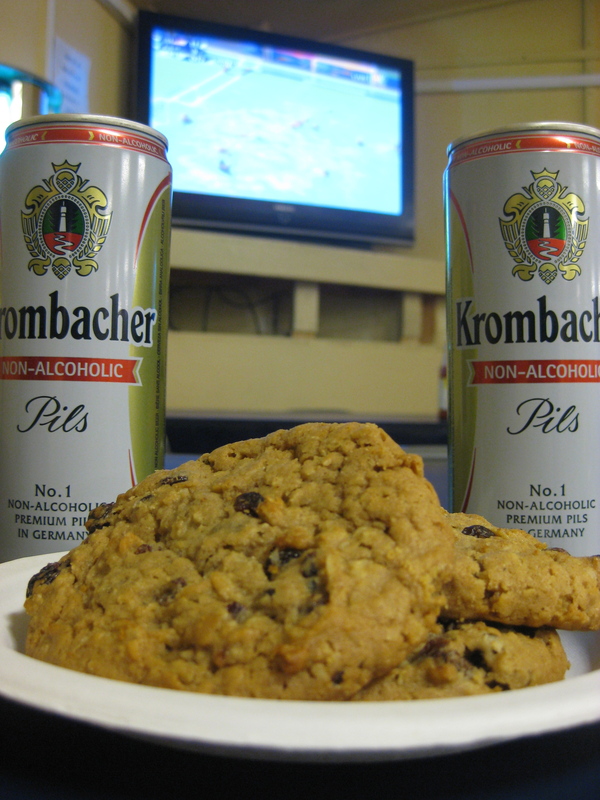 This pic was taken at Camp Eggers (we don’t have TV here in our DFAC) but replicates what happens here on Happy Hour Thursday! At least it is still a German beer albeit non-alcoholic! AARGH……. As for my favorite cookie (and my Dad’s), well, they do have oatmeal raisin here, too, and I indulge on Thursdays (I don’t eat four, usually two 🙂 ) — just call it my cheat day of the week! 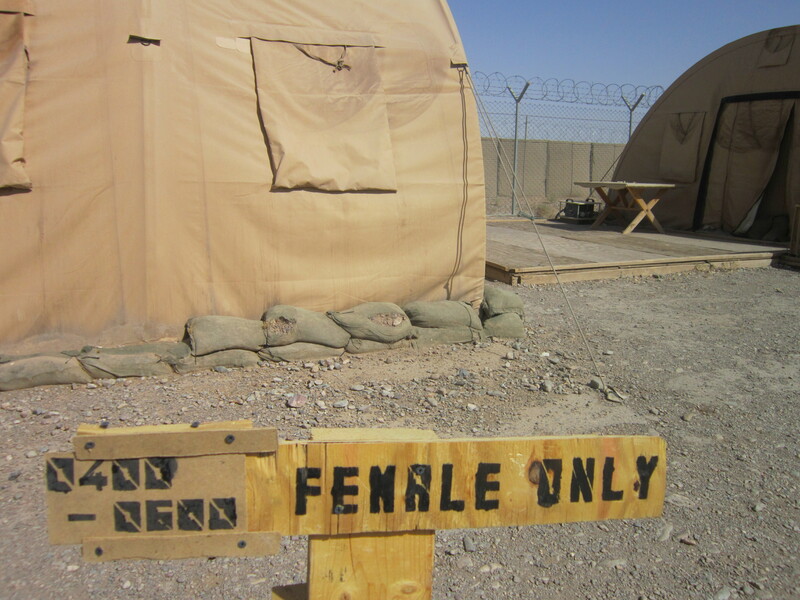 But, you have heard enough about where I lay my head down nightly so I figured I would enlighten you about my “compound”. Yes, a compound. I sleep, eat and breathe alongside my very eager soon to be pilot students and a few other fixed wing and rotary aviators that are mentoring our students! They are a joy to teach, drink chai tea with in the evening, and play “pseudo” beach volleyball in the compound. In my compound, you will find my living quarters, my classroom, and my gym. Everything else — the big gym, MWR, USO, the dining facility, post office, the PX, the Green Bean coffee joint — must be driven to, but not alone. Sound simple, however, Francine and I must always have as we call him, “a strapping young man” with us at all times. Honestly, Francine and I can fend for ourselves, but must adhere to the regulation — I think its reg 487C-4 subsection 2, but let me check with my colleague Richard who loves to quote the regs for me! For those of you that know Toby, this may sound familiar. Here is my gym and the times for the ladies — you think I really make it then? The tent on the left is the cardio tent — 3 treadmills, two elipticals, and a bike. The tent on the right (backside of it) is the weight room. Let’s just say that boys don’t lift anything lighter than 20 pounds, so why 10 pound weights? (I tried for 30 mins to get the next pic to load and gave up — but if was posted below it would be: an early pic of my classroom — a bit different now that there is a world map, 5W’s and present perfect tense hanging on the wall). Maybe I’ll try again tomorrow! !